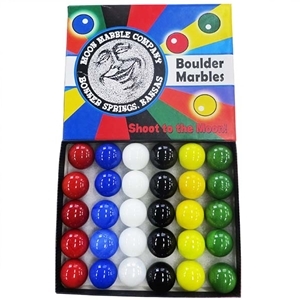 This is a set of 30 Game 1" Boulders. Comes with 6 colors, 5 of each color. These boxes are designed, printed, and assembled at the Moon Marble Company. They are also dated making them a collectible item. Marbles may vary slightly in size and color. Warning: Choking Hazard. Not for children under 5 years.